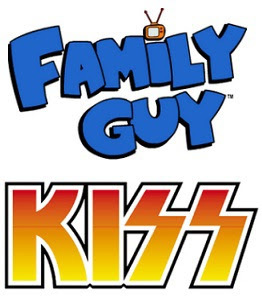 KISS and Family Guy have announced a new partnership that will see a Family Guy/KISS product line hit shelves this coming fall. The Family Guy/KISS line is a collaboration that taps into the band’s references within the show. So far, KISS has appeared three times on the series, providing viewers with insightful and hilarious nuggets that include Peter Griffin’s love for the band and the fact that Lois Griffin once dated Gene Simmons before he became famous. To support the program, Fox Consumer Products and Live Nation Merchandise, Kisses' licensing agent, will be looking for partners in the following categories: vinyl figures, bobble heads, apparel, plush, novelty, barware, social expressions and fine art. In music-related KISS news, the band hit the road July 20 for a summer tour with Motley Crue; shows are scheduled through to September 23.